Flagged samples, 12 June 2018. We have been partying here on the JR for the past two days (maybe even three, I lose track of time working the night shift!). Not THAT kind of party, but a science sampling party– it’s the only kind we’re doing here on the ship! First, let’s recap what happens prior to the sampling party. 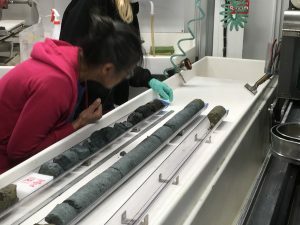 We have been retrieving hard-rock cores from Brothers volcano, and once the cores come into the core processing lab, the intact round cores are imaged and initially analyzed. Next, the whole round cores are split in half horizontally, making up the archive half and the working half. 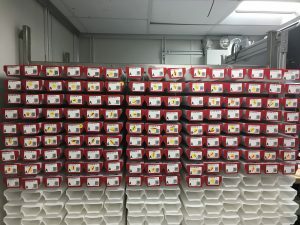 The archive half is used for non-destructive measurements, and then wrapped up, labeled, and (at the end of the expedition) shipped to one of the 4 International Ocean Discovery Program (IODP) core repositories around the world. The archive halves, waiting in their rack. This all done on board the ship, and data is then collected and analyzed. 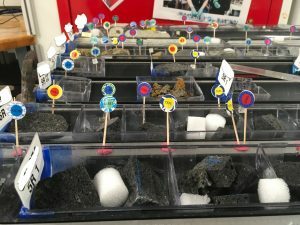 However, the scientists may want to do more work with the samples at their facilities on shore, and that’s where the term sampling party comes into play. Each scientist gets their own (festive!) colored sticker that they can set out near a rock section that they want to have shipped back home to them. This is not a speedy process, as everyone needs to work together to figure out who’s taking what sections and what they’ll be used for. 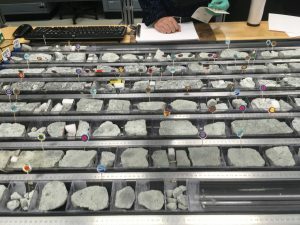 If multiple scientists desire the same section of rock, they can hopefully figure out a way to work together and share data. Ultimately, all of the sample requests are reviewed by the Sample Allocation Committee (SAC) and our on board curator to make sure everything is being done correctly and there’s no overlap. Stickers showing scientist names at their desired sample sections. We will have a few more sampling parties on board in the coming weeks, as we continue obtaining samples from Brothers volcano. Once the scientists receive the samples at their labs on shore, they will then get to work doing measurements and analysis of samples, ultimately producing peer-reviewed articles. This is not a fast process- it will take at least 6 months for the first bit of data analysis, then it takes quite some time to write up their findings and submit for review. I’m looking forward to reading about the findings in the next few years!